As a part of Payfort's annual state of Payment report that analyzes e-commerce and payment trends in the MENA region, Payfort conducted a survey among consumers in the region regarding the state of online shopping. 2015 was the best year so far when it comes to online shopping in the Arab world and it's growing steadily ever since. According to the report 53% of the Arab population shops online once per month minimum. While 7% of the respondents stated that they shop online twice a week. 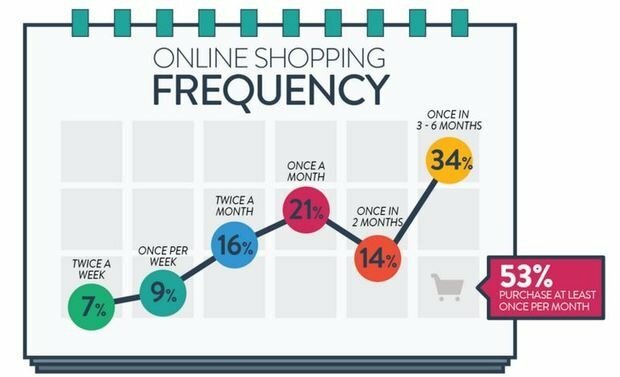 The reasons for shopping online varied across the sample surveyed, 33% shop online because it offers them better prices, 27% go online for the variety of products, 23% for the unique stuff found only online, 8% because it's a comfortable way to shop. 4% said that they shop online because it fits their busy lifestyle and another 4% said that it provided easy returns. Online shopping frequency in the region is increasing rapidly, catching up with the frequencies in developed markets.